Napier has been one cruise port that I have been looking forward to since I researched the Art Deco city. The city of Napier was destroyed by an earthquake back in 1931. They rebuilt the city in the new up and coming style Art Deco architecture. I love a well designed city and it was especially fun to walk in the down town area. It almost seemed like we were on a movie set. They even have a Napier Art Deco festival every year where everyone dresses up in 1930 style. Definitely a bucket list return visit. This is a photographer’s dream city and everywhere you look there is a tiny detail of the Art Deco Style. The downtown area is a mix of Art Deco buildings and modern storefronts. We loved taking pictures of the upper original portion of the buildings. We found the Art Deco theater and a small coffee shop with amazing fireplace and details features on the ceiling. Then we return the Marine Parade to see the band shelter. Downtown Area in Napier- It looks like a movie set. Interior of coffee shop also had amazing details. We had book the Country to Coast tour with Napier City Bike Tour for $85 NZD each. This tour transports you to the country where you can bike to six wineries and a cheese cafe. They give you a bike, helmet and a map for all the wineries for this self guided tour. The lady that help us was very nice and suggested that we tour the downtown area and come back for our tour which started at 10:30am. After our downtown self guided Art Deco tour we returned Napier City Bikes for the start of our tour. Our bikes were ready and waiting for us. We had already given them our heights in the reservation and they were properly sized. They had us try the bikes before they loaded them on the van. There was a short drive out towards the Tuki Tuki River. We were drop off with 2 other couples at a Black Barn Winery. Before we started with the bike tour we stopped into the Black Barn wine tasting room for a couple of free samples. We sampled the wine and explore the amazing restaurant with a view. Our favorite part was the grapevine patio where you eat and drink under the grapevines. They even had a small gift shop. After our visit we started our bike ride to the next winery. So we might have gotten lost a little try to find the path between these wineries but it was only 5 mins before we realized our mistake. It is almost across the street but we still got lost. We arrived at Te Mata winery for the wine tasting. There was a small fee for the tasting. They had a nice wine tasting room and the host was very knowledgeable about wine. This was our favorite stop. All the people in our group arrived together so did the tasting together. The lady that did the tasting was a gem and was very knowledgeable about cheese. Who knew there was so much info about cow cheese vs goat cheese. Not this Wisconsin girl. There was some smelly cheese but there was some delightfully good cheese. There was a small fee for the cheese tasting. But well worth it. Cheese Tasting. The host was a gem! Our group of bike riders bonding over cheese. Our group continued on to Akarangi but being the slow biker we skipped that winery to stay on track. Of course the winery we skipped was the only winery with sweet wine. (my favorite) agh! The next stretch of the bike ride was along a riverbank. The path was easy and straight and flat all the things I like but I am still slow. There were several gates for cows that you had to go through which was a challenge with a bike. Then we crossed over a big bridge and soon arrived at the coast. The coast was windy but so beautiful. Who knew Cows could be Frisky? 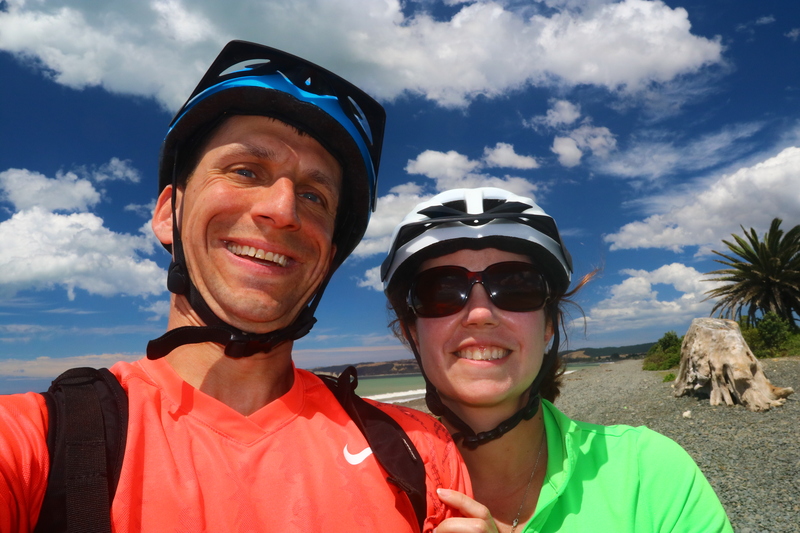 We continued biking up the coast towards Cape Kidnappers. The next winery Beach House was closed so we skipped it. There was a delightful fruit stand selling fresh fruit along the path which included free peach samples. The next stop Elephant Hill winery. We just got inside when the others in our group arrived. We all had another flight of wine and enjoyed the amazing scenery of the Elephant Hill. There was a fee for the wine tasting at this winery. By the time we were done the van was there to pick us up at 4pm and take us back to Napier. There were two more wineries past Elephant Hill- Clearview Estates and Te Awanga Estates that we didn’t have time to visit. The time seemed to fly by but when you are drinking and biking I guess that is what happens. The van loaded our bikes and transported us back to Napier where we had a little more time to explore the downtown area before our cruise left. I highly recommend the Napier City Bike Tours They have several self guided tours and guided tours. Everyone we interacted with at the company was very friendly. This is a logistic heavy tour but they seem to manage it with ease and a smile. I guess we did the bike ride all wrong? Or maybe not. This is part of a larger trip report, Please read more at the following links. Cruise New Zealand- Dunedin- Otago Pennisula- Coming soon! New Zealand Cruise- Milford Sound, Doubtful Sound & Dusty Sound- Coming soon! New Zealand Cruise- Sydney- Bondi Beach- Coming soon!